At the Ruth Easton New Play Library, located in the lobby of Pillsbury House and Theatre, you can find and read new plays that are being produced around the Twin Cities. Participating theatres include: Children’s Theatre Company, Freshwater Theatre, In the Heart of the Beast Puppet and Mask Theatre, Mixed Blood Theatre Company, Mu Performing Arts, Pillsbury House Theatre, The Playwrights’ Center, Sandbox Theatre, Savage Umbrella, and Workhaus Collective. Anyone may check out a script to read in the Pillsbury House and Theatre lobby. To check out a script to read, ask at the front desk. Pick up a copy of the featured script, or browse the script index and check out something else to read. Write your name, date, and email address on the check-out slip, give the slip to the front desk, and turn the script back in when you are finished. All scripts must stay in the lobby and are not to leave the building. DOES THIS LOOK GAY ON ME? I WOULD NEVER LIVE IN A SOCIAL DEMOCRACY. THE LINES ARE WAY TOO LONG. Actress Ruth Easton (née Edelstein) was born in North Branch, Minnesota and graduated from North Branch High School. She attended the University of Minnesota for one year and the following year attended Macalester College before finishing her collegiate career at Cumnock School in Los Angeles. She went on to New York where she studied acting with Oliver Morosco. Mr. Morosco opened a stock theater company in upstate New York where Ms. Easton starred in several plays. After performing with other stock theater companies, she returned to New York City where she appeared in five Broadway plays over a period of seven years. They included Exceedingly Small, Privilege Car, Town Bay, Buckaroo, and Charlie Chan. Exceedingly Small was directed by Ethel Barrymore and Easton played opposite Eric Dressler. New York critics praised her performance as “thoroughly touching” and “highly spirited and excellent.” She starred in radio dramas on the Rudy Vallee Hour and the Fleischmann’s Yeast Hour opposite such actors as Walter Huston, Judith Anderson and Lionel Barrymore. She also appeared with Clark Gable, Eddie Cantor and Al Jolson during the course of her career. 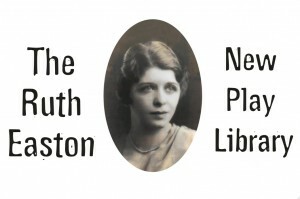 Ms. Easton’s legacy, her commitment to theater and the development of new works continues through the charitable gifts distributed through the Ruth Easton Fund of the Edelstein Family Foundation. For questions on the library, or to submit a new work that is being produced in the area, contact Chris Harrison, harrisonc@pillsburyhousetheatre.org or 612-787-3622.